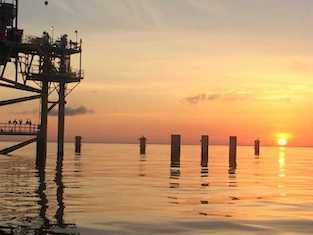 Plan a Dauphin Island Fishing Charter trip you won’t soon forget with FinAtics Fishing Charters, voted #1 Local Fishing Charter! 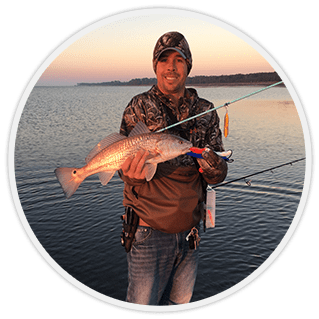 Based in Dauphin Island, AL, and Servicing the Eastern Shore/Gulf Shores/Orange Beach and Fort Morgan, AL we have the best charter boats and saltwater fishing guides that take you to some of the best saltwater fishing around the island in the surrounding areas. Our guides create a warm, friendly atmosphere perfect for families. Backed by more than 10 years of experience, we work exceptionally well with kids and ensure everyone has a great time. 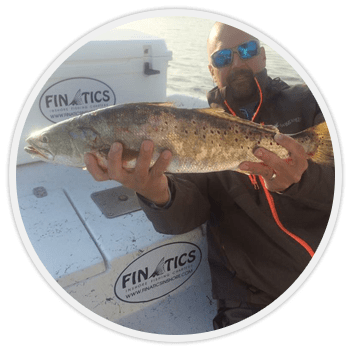 FinAtics Inshore Fishing Charters invites you to explore the beautiful waters in and around Dauphin Island, as well as the surrounding rivers. 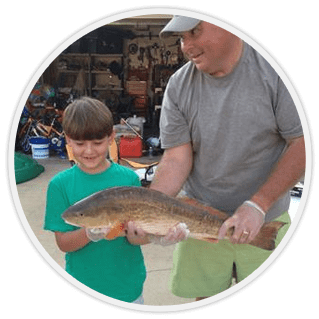 Captain Chad can pick you up from Gulf Shores, Orange Beach and Fort Morgan, so no matter where you choose to visit, you’ll be able to enjoy an exciting and fruitful adventure that is great for the whole family! 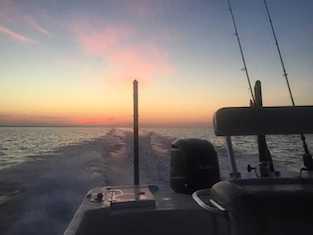 FinAtics Inshore Fishing Charters will take you out aboard a brand-new 2019 26’ Avenger center console. It comes powered by a 300 HP Yamaha engine and provides comfortable fishing space for up to six anglers. 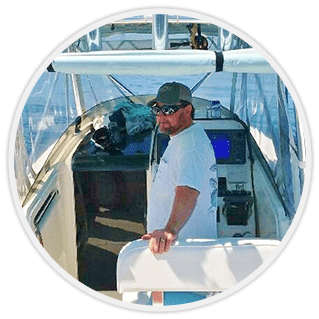 The boat is stable and is outfitted with top-notch navigational and fish finding electronics, as well as other professional tools and accessories to save your time while searching for fish. Thank you for visiting finaticscharters.com! During our Spring Break trip to Dauphin Island I had the opportunity to take my 12 yr old son and 9 yr old daughter on a fishing trip with FinAtic’s Charters. Didn’t take long and we were on the fish. They were big too. I set the hook into giant sheepshead and it ended up snapping the rod early in the fight. I continued to try and get it in with half a rod, but it got off right at the boat. It was crazy. We had a blast going out and catching fish until our arms got sore. I want to give a special thanks to Captain Erik. He made sure we had a great experience. My kids can’t wait to come back south and go fishing with FinAtic’s again. Our family of 6 went out on March 14, 2018 and had an amazing morning. We ended up with more sheepshead than we could eat! Plus we saw a sea turtle and dolphins! I highly recommend booking with Finatics! Best Fishing Charter Experience we’ve had! We went out with captain Chad and had a blast! We took my 4 year old daughter and he was fantastic with her. He had her netting and reeling them in on her own. Everyone had a great time and we caught a lot of fish. 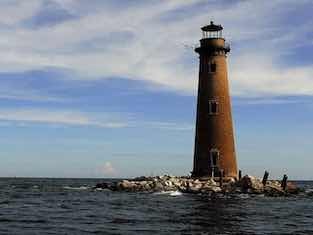 We will definitely do it again when we return to Dauphin Island. Our guide was Jason, he got us on fish right away and it was a blast! He knew the area, was extremely friendly and made it fun. For those learning he has an easy teaching style and if you just listen you can’t go wrong. Finished with our limit and several pounds of great eating fish. Thank you Finatics! Capt. Jason was great! It didn’t take him very long to put us on some great size trout. He was very professional and knew his way around the boat and water. Jason was also great getting the teens excited about the catch…thanks! I surprised my hubby with an inshore fishing trip with Capt. Chad and we had a blast! We caught our limit, minus the “one that got away” during our 3.5 hour trip. Chad is smart, professional and down right funny. Just don’t bring bananas on the boat! Best birthday fishing trip ever! Family of five with children ranging from 8 to 13. Went out for an early morning trip and had a blast! Captain Chad did a fantastic job engaging our kids and keeping them excited! He has a great sense of humor and is also super patient with novice fisherman. Did I mention he also put us on fish? We will be back! Capt Chad was very hospitable and worked hard to put us on fish all morning! 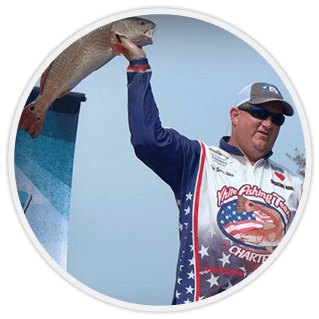 I would recommend him to anyone looking for a high quality inshore experience.